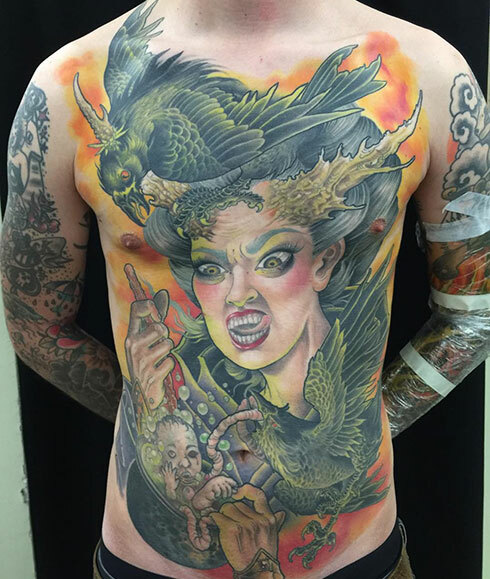 When I first got started in tattooing, I remember being blown away by the work coming out of Australia. The ever changing style of neo-traditional being pushed out by the heavyweight giants from the other side of the world melted my mind. 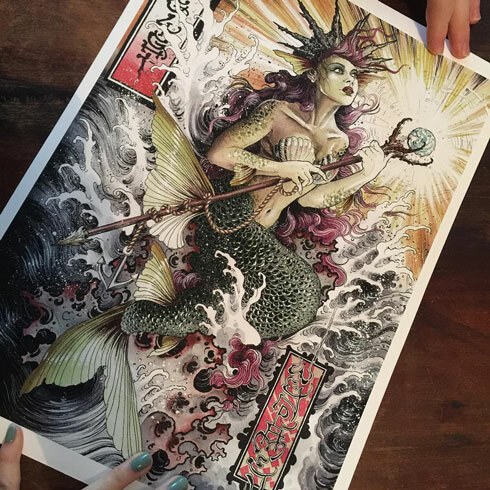 Wendy Pham, one of the many incredible talents from across the seas, was one of my biggest influences back then so to get the opportunity to chat with her and pick her brain was incredibly humbling. 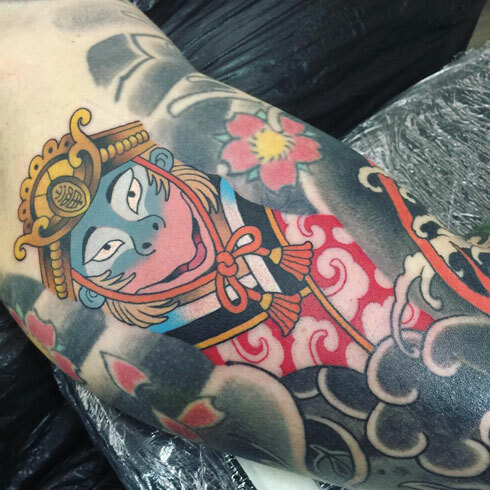 Wendy’s blend of westernised Japanese with strong neo-trad elements really does stand out a mile, making for some incredibly refreshing tattoos. 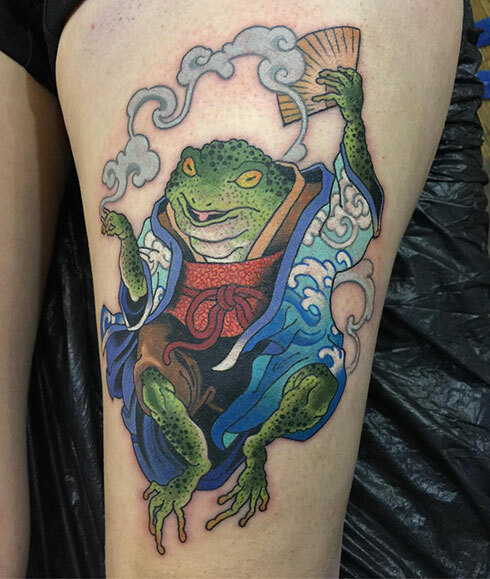 Wendy Pham now works from Taiko Gallery in Berlin alongside the equally talented Guen Douglas so we caught up with them at the 10th annual Brighton Tattoo Convention, with Guen’s interview following soon. I have been tattooing for over 11 years now. I first discovered tattooing when I was a teenager, and met my mentor when my friend was getting a belly button piercing at a local tattoo shop in Australia. I showed her some drawings, and eventually, she asked if I wanted to be an apprentice because she was opening a new shop. So by the time I was 16 I was working in her shop doing reception work, cleaning, and doing really bad drawings because I had no clue what I was doing. About a year or so later, I got to tattoo some people for free until I got good enough to charge for them – I was definitely not good enough to charge money when I started to, but everyone is terrible at the beginning I guess. 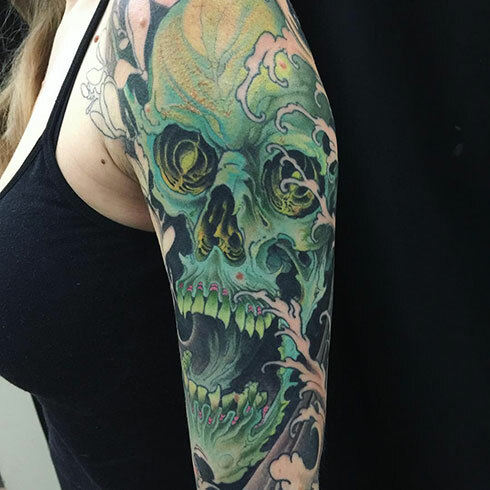 What made you decide to become a tattoo artist? I was first really interested when I was watching a Linkin Park music video when I was 15, I thought “Hey that guy looks cool!” and I drew pen ‘tattoos’ on myself at school. My friends said I should be a tattoo artist, and I began to pursue it straight away. At what point in your career did you feel you had finally found a style to be happy with and how did you get there? Oh man, I really don’t know for sure, I actually still don’t know if I’m happy with my style completely- few artists are. I’m happy enough that people like my work, I’m always grateful for that. I think art is like a sandwich- it always seems better when someone else makes it. When I was a child I was always watching cartoons just like any kid. Walt Disney and Sailor Moon were my favourites and I copied the drawings of the characters over and over. I loved anything with animals wearing clothes, and the really cool Disney villains. For tattooing, I think it’s the people who I idolised when I was learning, like Shige, Jee Sayalero, Paul Booth, Sabine Gaffron, Jeff Gogue, and so many more for sure. I saw Grimes work a bit later on and that really blew my mind. How do you come up with fresh ideas and concepts? I try to look at other things other than Instagram for influence. I have a big collection of books from over the years, so when I get bored or stuck for ideas, I look through my books to get me excited about making art again. I watch animated movies too and get lots of ideas there. I also have a lot of time to think when I tattoo, for example when a client is not very talkative, I have hours in my own mind, and I just think of random ideas then. I also think about what to eat for dinner etc. What made you decide to open Taiko Gallery? Is it a street shop or a private studio? My friends who have an art studio pointed out one day that the place next to them was available to rent, and I took the opportunity straight away. I think every tattoo artist wants to have their own place eventually, and I had been working for others so long, I felt ready to have my own shop, where I could listen to my bad music without getting judged. It’s a private shop, and it’s just Guen Douglas and myself. It’s small and quiet and a fun and friendly environment. Berlin is full of world-class tattooers, did that influence your choice to move there? I moved to Berlin because I was getting a bit sick of being in Australia, and I wanted to work with Uncle Allan. I really didn’t know about many artists in Berlin, I only discovered them after I moved. There really are so many great artists here doing so many different styles. 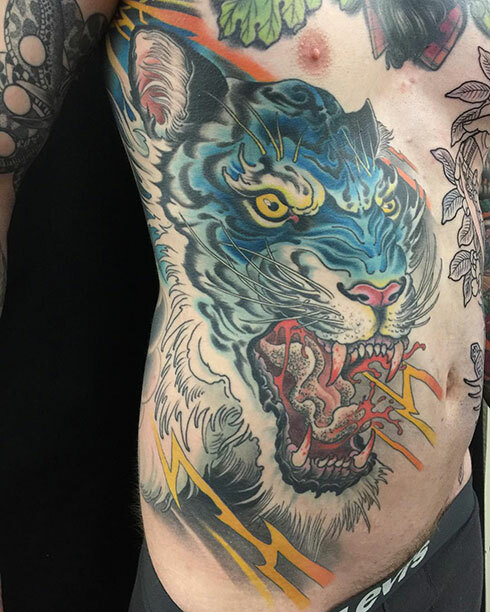 How have you found going from tattooing to having to manage a studio alongside that? I had a studio in Melbourne before, so this is really my second studio. It’s really not too hard to manage – pay the rent, buy supplies, keep it clean… it’s just like having a house I suppose. What are your favourite tattoo machines right now? My favourite machines at the moment are the Onamission coil machines. I have three of them now. They work so great with how I tattoo. I also still use the machines I had when I started, the Micky Sharpz. Sometimes people laugh at me for using them still. Our readers would love to hear more about your choice of needles and inks, with such vibrant colours and clean, varied lines. Any particular brands or groupings you’re pleased with? For inks, I’m using some Dermaglo and some Eternal. The needles I use a variety- the Tatsoul Envy needles, Magic Moon, Ion needles and Black Claw…I like having a lot of different ones depending on the piece. I use 3, 5, 7, 9 rounds for lining and for shading usually a 9 or 11 mag. I use the Tatsoul disposable wrath tubes too- the thickest ones. I rarely have hand or wrist pain. A lot of people don’t like the weight imbalance of using disposable tubes, but you get used to it and you don’t have to clean them! 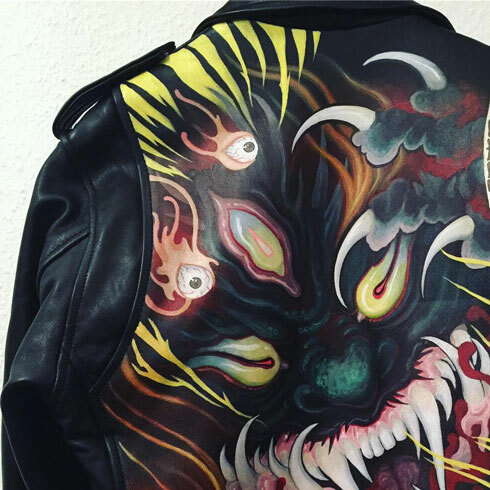 How did you find painting the jacket for #hellbentforleather? Had you painted on leather before? I found painting the jacket really fun, and no I never painted leather before. We were given this awesome leather paint called Angelus which was really smooth and easy to use. A lot of your paintings have a more realistic vibe to them, have you ever tattooed any portraits or anything like that? I tattooed a few portraits before, but I really think it’s too stressful. When it’s a painting its okay to make mistakes because you can throw it away or keep painting until it looks better. One time I was painting a woman’s face, and she looked like Jake Gyllenhaal, then David Bowie, I had to fix it so much because she kept looking like a guy. 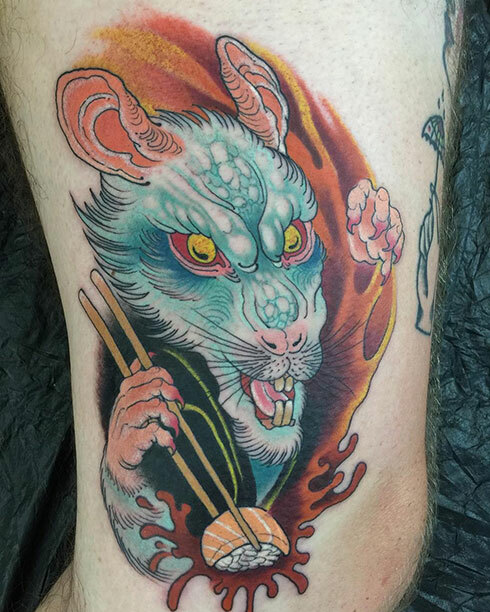 Do you have a favourite story from your time within tattooing? When I was working in Australia, there was an artist John Entwistle – who has been tattooing over 40 years now according to Google – who also sold tattoo supplies. I was waiting to buy some tubes, and John was talking to a guy who came in before me. The guy handed John a design and started talking about where he wants what colours. Then John takes the paper and says “ How about you give me the paper, and I’ll tell YOU where the colours go.” John was always so friendly to me though, even when I was a 15-year-old idiot asking if tattoos hurt and how do I learn to tattoo. One day I want to be like John Entwistle.